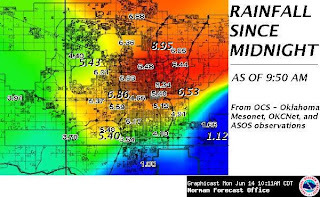 See here for other heavy rainfall posts. June 15 AM Update: The final daily rainfall for Oklahoma City is 7.62". This breaks the all-time daily rainfall record for any day in any month. The old record was 7.53" on Sept. 22, 1970. 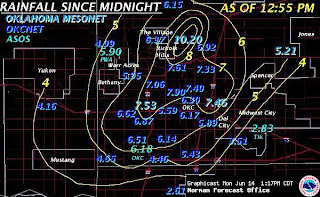 Midnight Update: Another 0.05" fell in the remainder of the 11:00 hour, plus 0.11" ending at midnight. The estimated total is now 7.35" with one more hour remaining (daily records are kept on standard time). Late PM Update: Another round of heavy thunderstorms this evening has added to the total: 0.12" through 7 pm CDT, then 0.89" more by 10:25, with a moderate thunderstorm continuing. This brings the unofficial (and incomplete) daily total to 7.19", easily breaking the all-time June daily record by close to half an inch (see below). 1 PM CDT Update: An additional 0.19" fell in the hour ending at 1:00, bringing the 6-hour total to 3.94" and the daily total to 6.18". Highest daily totals in the area are now over 10". More thunderstorms are moving into central Oklahoma with heavy rain likely between 3 and 4 pm. The Oklahoma City metro area this morning joined the list of major cities smashing rainfall records in the last several years. As of 11 am CDT, the 5.88" so far today has blown past the previous June 14 record of 3.95" in 1930. Rain continues to fall, although at a lower rate; 0.17" fell in the hour ending at noon CDT. The all-time June daily record is 6.75" on June 3, 1932. 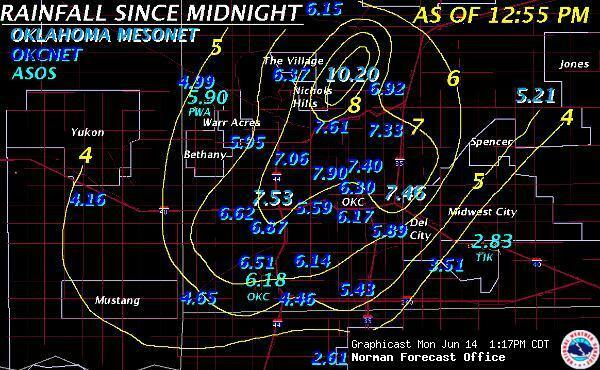 Weather records in Oklahoma City extend back to 1890. Rainfall amounts in the region range as high as nearly 9". Local TV station KOCO is reporting portions of several interstate highways have been flooded.